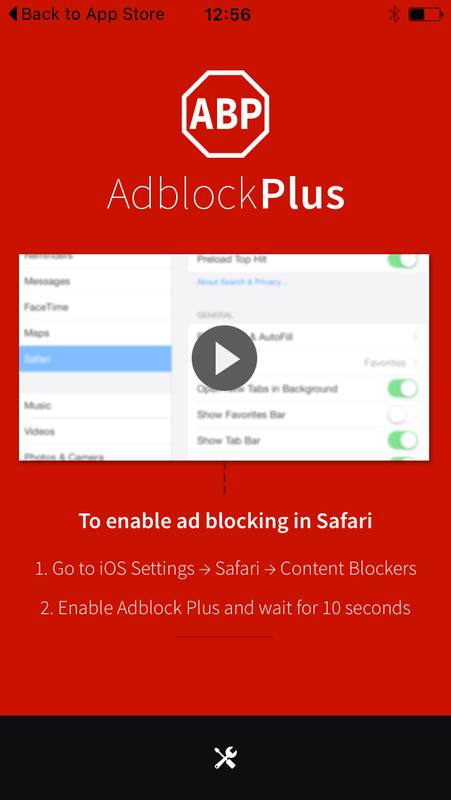 Adblock Plus and (a little) more: Adblock Plus for iOS is finally here! Pssst, it's free! We know, we know — it took us long enough to get there. Sorry about that, but the wait is finally over: Adblock Plus for iOS is available for completely free on Apple’s App Store. It’s a way to block ads on your Safari browser on Apple iPhones and iPads. You can now begin saving data, protecting yourself from malvertising, enhancing your privacy and saving your battery, because the original ad blocker is finally here for your Apple device. 1. 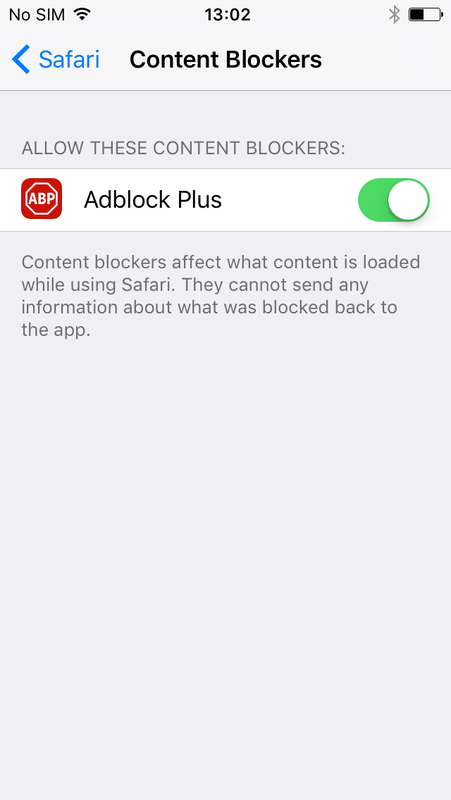 First install the Adblock Plus for iOS app from the Apple App Store. 2. When the app opens, you will see instructions on how to activate the familiar content blocking features of Adblock Plus within your system-wide iOS settings. 3. After activation, Adblock Plus will block annoying ads in Safari. That’s it! Because Safari is the default browser on iOS devices, when you click on any URL link in an email, text message or website, the Safari browser will open — and we’ll be there to block any annoying ads. You’ll also get security from malvertising, better privacy, and see longer battery life and faster page downloads. Thank you for bring the ABP experience to the iOS safari; however, I feel a little disappointed when I found out this app is lacking a lot of the features that can be found on both desktop version or the previously released mobile browser version. The most notable feature that are lacking in this app is the ability to configure the language specific rule set which is a huge bummer. If you also browse websites of non-english countries the accuracy of adblocking will decrease dramatically. I hope you will address this issue in the future update, and adding the ability to whitelist websites will also be appreciated. Thanks for the feedback, I’ll share with our QA team. Bear in mind that Adblock Browser for iOS has an expanded number of features: adblockbrowser.org Maybe this is a better fit for you? All this waiting only to find my iPhone 5 is not compatible. Nooooooooooooooooooooooooooooooooo! This is a nice start but a key feature that is lacking is the ability to block ad-trackers. Blocking ads is nice but a way to block ad-trackers is also a must. One major feature I wish to see from an adblocker for Safari is a way to block re-directs in safari so apps can’t use Safari to open the AppStore or load dangerous websites. Ads showing in apps is fine, them re-directing you out of the app is not. When will this work with Chrome? It already does work on Chrome desktop. Unfortunately, the mobile version of Chrome does not support extensions. But if you don’t like using Safari with our app, I’ve got something better for you: Adblock Browser for iOS. I’ve been using Your blocker and for the most of the time it works. But if you go here http://mobil.dn.se/ all images are blocked. Thanks for reporting, Metafor. Will report. Hello. Is there any tool you used to convert easylists to json format for safari extensions? Thanks for the repo. I’m kinda lost how I can execute the .js files and apply them to a region easylist? I assume that if i disable the ‘allow acceptable ads’ option then all ads will be blocked. If not, a Block All option would be appreciated. Also, i agree with the earlier comment, please prevent sits from redirecting e.g. opening a popup that redirects to app store. Very annoying when a web site can potentially boot you out of safari and into app store! You assume correctly :) If you disable Acceptable Ads you’ll block all ads. Thanks for the tip on the other point, we’ll note it! Did you think about bypassing Apple’s 50000 rules limitation by releasing different ABP apps for every supported country-specific EasyList? E.g. for Russian sites the efficiency of current ad-blocking is almost non-existing, what is extremely upsetting, knowing how good ABP on other platforms is. We could register multiple content blockers to work around that limitation, but we’ve refrained from that so far. We’re trying to reduce the number of rules as much as possible first, we have some leeway there. If nothing else works, we will probably resort to having multiple blockers the user needs to enable. Why Iphone4s is not support ? I update my IPhone to 9.0.2. Dose it provided content blocking capability? Hi Johnson, the app only works on iPhones 5s and newer models with iOS 9 installed, because it needs a 64 bits device to work. Best, Ben. Hey WA, thanks for your comment. Besides iOS 9 the app also needs a 64 bits device to function. Best, Ben. I also have the iPhone 4s on 9.0.2 and not able to apply this; I think the answer to question 2 didn’t make any sense btw, the iPhone 5 clearly runs IOS and should also be compatible. I’ll sit tight until you sort out this simple glitch. Hi Ryan, thanks for your comment. I’m sorry for my late reply. The problem with the IPhone 4 is that its not a 64 bits device which is needed to run the app. Best, Ben. Are you working on more feature for the app, like a whitelist and others? It would be nice if you build dropbox syncing of the whitelist into the desktop and mobile versions. You said content blocking only works on iOS9 and that is why iPhone 5 is not supported. Is that really true? Apple does support iOS9 on iPhone 5 and I am running it on my device. Yet, I cannot install adblock plus on my phone. Hi AK, thanks for your comment, and apologies for my late reply. The app works only on iPhone 5s and newer devices with iOS 9 and 64 bit memory. Best, Ben. Hey Anders, thanks for helping out! Could you add a separate anti-tracking app specifically blocking trackers? Hey Chris, thanks for your comment. We’re working on making the filter lists available for the app. Best, Ben. Greetings, and thanks for the blocker. Was wondering if you’d consider implementing a user-defined whitelist option. While the option to reload a page without content blockers takes care of the issue up to a point, it still means a reload and more data usage. Keep up the good work. It’s a great idea, but the only real solution is to click on the ABP icon and disable ABP on the sites you want to support. I have iPhone 5s with iOS 9.0.2 still it says your app isn’t compatible. However, my device meets all the requirements. HELP!!!! Re: your reply to my question n.17 above: What “ABP icon” is it that I should click on? This is not for desktop, this is for the iOS content blocker, which as far as I was able to see has the option to allow acceptable ads but not to modify what ads are to be considered acceptable, nor to indicate what sites should not have ads blocked, which by the way is the feature I suggested in my question. If I have been missing this feature, may you be more specific as to where to find it? I am reading with attention this page and nowhere we can find an answer to the Iphone5/iOS9 issue. Hi Luc, thanks for your comment. The app works only with iPhone 5s and newer models with iOS 9 and 64 bits. Best, Ben. Guys the app is still not compatible with iPhone 5/5c/4s. Those devices run correctly iOS 9.1 but it’s impossible download it from AppStore. I think you have to change requirements on the app page. #21, #22: Read answer #15. Because of Apple you need 64bit hardware to be able to use content blocking. Your devices are probably 32bit, regardles of running ios9. Thanks for helping out here. Best, Ben. Good start, however blocks links throu on Autotrader. I.e. When you select a car on the list and try to go to the details? Hey Ben, thanks for answering my comment #19. I remain puzzled: how do you mean “you can chose to disable Adblock Plus for iOS on the pages you like to”? Do you mean I can reload the page without the blocker, via long press of the reload button? Because otherwise, I don’t see what option I have to disable Adblock Plus on a per-page or per-site basis. The app itself only enables or disables the whole blocker and allows to activate acceptable ads, but I don’t see a place where I can set a site or a page not to be blocked, neither in the app nor in the Safari settings and there is no section for the app in the Settings system app. Can you please clarify how to disable ABP for pages I like to? Not work on iPhone 4S? But it can run iOS 9.1 just like the newiest iPhone, so wtf? Hey Erman, thanks for your comment. Unfortunately the app only only works on iPhone 5s and newer devices with iOS 9 and 64 bit memory. Best, Ben. Not compatible with this ipad….. I have an ipad 2 running ios9.1. I thought ios9 was the requirement? Hi Hans, thanks for your comment and sorry to hear that it doesn’t work on your iPad. The app needs iOS 9, but also a 64 bits device to function. Best, Ben. i was irritated to hear that the ipod touch 5 was apparently left out and i can’t use it why was it not included ??? i need an adblocker i can use plz include the aforementioned if possible. At last, after so many years! Thank apple and thank adblock plus! For the first version it’s already great. It would be nice if in the next version you can add also the trackers and the social networks blocking feature, which are like virus that have infected the whole web. PS: At the end they are the same, social networks use their “buttons” to track their users and the anonymous too.